As for these bowls, they are a super cheap and freaking delicious way to get in your protein and good fats. Basically a macro meal made in heaven! (Just kidding, I don’t really know much about macros, but I think this one would be approved!) And don’t even get me started on the cilantro lime dressing. I could DRINK the stuff. These avocado tuna bowls are pocket-friendly, too. With farmers market days around the corner, fresh veggies are affordable and readily available. All you need are five wholesome ingredients for the bowls themselves. Also, the cilantro lime dressing is fresh, and has a tart and delicious flavor that pairs well with many recipes. I like to make a double batch and keep it stored in my refrigerator for my salads and grain bowls. Or you can use it as a dip! Don’t forget to use snapea crisps as a crunchy gluten-free crouton on top. I like adding the black pepper flavor for the perfect balance of spice. 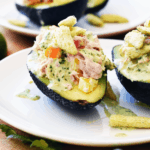 Don’t these avocado tuna bowls look so vibrant and satisfying? Go make them ASAP. Grab the recipe below and enjoy! 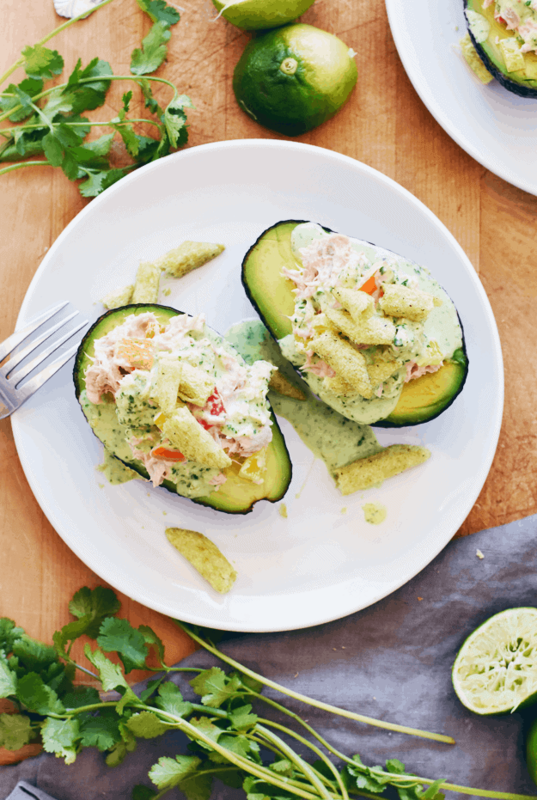 These avocado tuna bowls with cilantro lime dressing can be made for lunch or dinner in just 10 minutes. Meaning, they're o-fish-ally the best meal ever! Pour the lime juice, yogurt, olive oil, water, garlic, cilantro, and salt in a blender. Blend on high speed about 2 minutes, until cilantro is well chopped and the dressing turns a light green color. Scrape down dressing from sides, transfer to a sealed container and place in refrigerator to chill. Mix the tuna, mayo, bell peppers, and salt in a small mixing bowl. 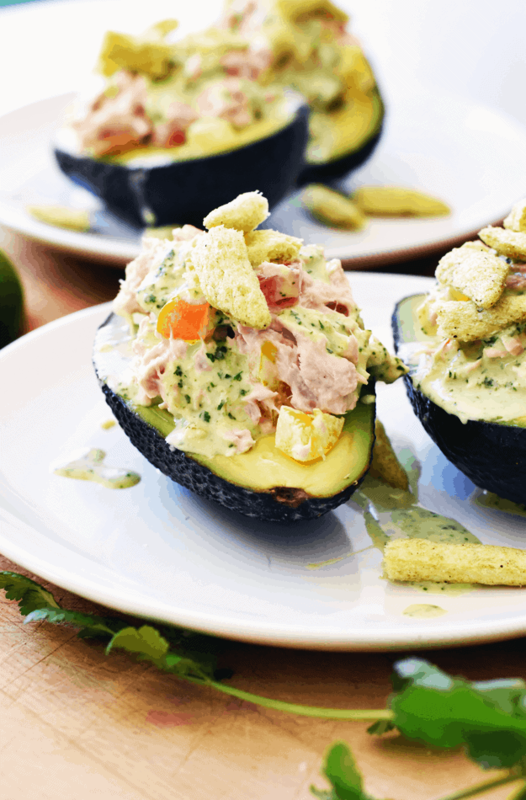 Fill each avocado pit with 1/2-1 cup of the tuna mixture. Drizzle with the cilantro lime dressing and top with crumbled crisps. Serve immediately and enjoy! I love avocado! This looks wonderfully flavorful! We love those snaps! And avocado boats! This looks divine! I am always looking for a filling, cool meal that won’t mean standing in the hot kitchen! 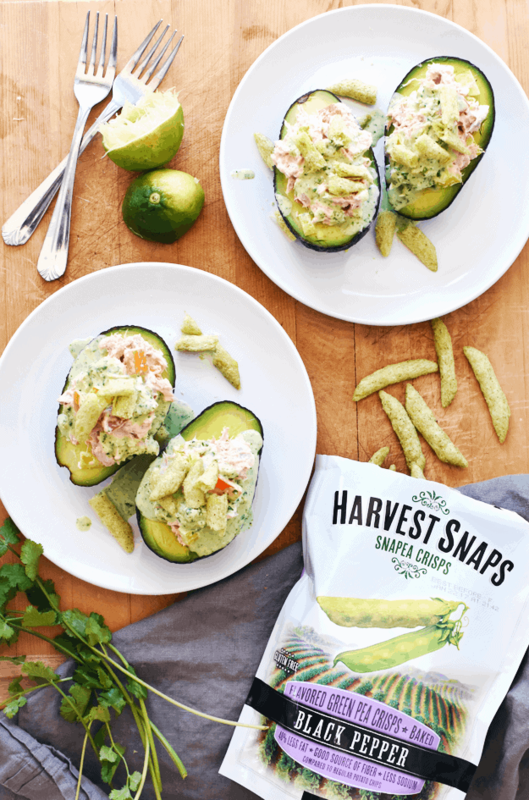 Also I just tried the Harvest Snaps this week at work! My kids have harvest snaps in their lunches almost daily! We love them! This would get them to eat tuna for sure!